That night I drew the design onto a towel with a wash-away quilt marker and stitched him up. 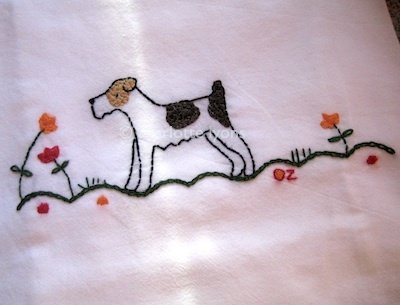 So cute that I uploaded the design to Spoonflower and turned him into a yard of fabric just for Anne. By now, I've made a few projects out of it which I'll show you later after I send them to her. Loved the fabric design so much that I tweaked it to remove his name (actually just the Z) and then posted it on the Spoonflower site for sale. Seriously, I could do this all day long. Draw, stitch, make, sew. Repeat. 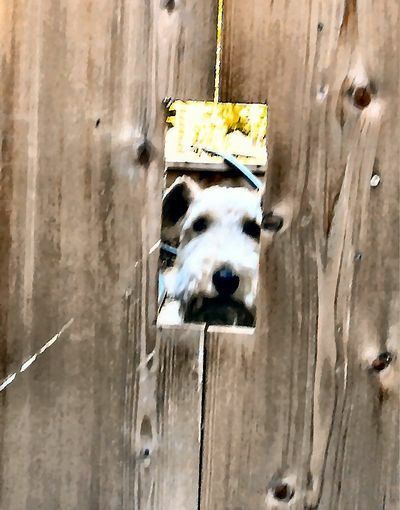 That's Ozzie peeking through his custom window in the garden gate.